Are NOW Essential Oils Too Good to Be True? This post was sponsored by NOW as part of an Influencer Activation for Influence Central and all opinions expressed in my post are my own. Let’s talk about NOW essential oils! What’s the truth, though? Is NOW priced so low because it’s…not really that natural? Or is there more to this company and brand? I was invited to visit the NOW headquarters recently, and jumped at the chance. On this trip, I was able to tour their facilities, meet their CEO, and get the real skinny on what’s going on over there. I know you’re all curious…so it’s time to dive in! NOW is one of the largest organic and natural brands out there right now. They’ve been around since 1968, and currently have widely-available lines in essential oils, supplements, food, personal care, sports nutrition, and more. They’re constantly adding new products and expanding their line — and the people they can reach. Most people know that NOW’s products tend to be fairly inexpensive compared to competing products, which has led to some dismissing them as ‘not really quality’ — because how could they be so much cheaper without cutting corners? It’s kind of ironic, actually. So many people wish that there were quality, affordable organic/natural products because “natural living is too expensive!” yet when a brand actually is affordable…people don’t trust that it’s actually natural! We need quality, affordable, natural options! So…where does NOW stand? I was invited for one of their “Immersion Events” on July 27 – 28 — a whirlwind, 36-hour trip filled with meet-and-greets, tours, and informational sessions. NOW does these several times a year for different groups. They did pay for everything (plane, hotel, food, etc.) as well as compensating me for sharing my experience with you. I’m telling you so we’re 100% clear, because transparency is important to me! But this won’t change what I tell you. NOW essential oils have typically been dismissed because they are admittedly quite a bit cheaper than most. So naturally, people want to know…HOW?! Obviously, NOW essential oils are far cheaper than all the others. How can they possibly pull this off…and still be quality? It’s a business thing. Something super important to note is that DT, YL, and PT are all essential oil companies. That’s the main/only thing they sell. All of their money has to come from selling essential oils…so all of their oils have to be priced a bit higher in order to cover their margins and still make a profit. DT and YL are also MLM companies, which means they have to pay consultants, the upline, etc. NOW is not an essential oil company. Essential oils are just one of the products that they sell. They can, and have chosen, to take much smaller margins on their essential oils because they can make it up in other areas of the business. That’s a big reason why they are cheaper — their profit margins are much smaller! This is one of the core values of the business — good value. Their mission includes being the most affordable (not the cheapest in all cases!) for the product that they have. They don’t do big bonuses for the upper management like other companies do. In fact, the CEO told us he was pretty excited with his $5000 bonus last year — which is the exact same bonus that every employee in the company got, from the janitor on up! But of course…none of this matters if NOW essential oils aren’t quality. So…are they? We were invited into the actual labs at the NOW headquarters, to actually see their testing processes and talk to one of their lead chemists. This tells us more about the NOW essential oils, in detail! I’m telling you…they do more tests than basically any company I’m familiar with. They start with the industry standard, which is the GC/MS test, to verify that each oil is not only the correct oil, but also the correct species. Then, they verify that it contains the exact right chemical constituents that are supposed to be in that oil. This is the only way to be sure of what you are getting — smell will not do it. And yes, NOW does all of this testing. Read more about NOW’s testing procedures. So, the oils are pure. They are high-quality. NOW is releasing more and more organic oils, too (with plans to continue doing so). By the way, NOW tests all of their products this carefully. They test every single raw material that comes into their facility for contaminants, GMOs, chemical constituents, etc. If anything is found to be “off,” the materials are rejected. If it’s a big issue or an ongoing issue, then NOW will stop sourcing from that company and find someone else. All of their products are GMO-free, although only 70% are currently Non-GMO Project Verified (but they are seeking certification for more of their items). This is how everyone dresses inside their facility! Clean smocks, hair nets (including beard nets for the guys), and safety goggles. One of their many labs — tests for super specific contaminants and chemical constituents. This is one of their supplement machines (I forget if it’s making capsules or tablets, but it’s one of them). This is inside of a clean room. Every individual product or blend is created inside of a clean room so there’s no chance of cross contamination. Because of this process and their testing, they guarantee that what they say is in the product on the label, is what’s actually in the product. Learn more about NOW essential oils. So, that’s the good. What about the bad? None of the bad actually deals with the quality of the product. Rather, I think that their labeling and marketing do not accurately reflect what they’re actually doing. NOW doesn’t provide a whole lot of specific safety info on their labels. They simply provide standard FDA disclaimers, warnings to consult a health professional if pregnant/nursing, and not to use the oil internally. Other brands are giving detailed information on proper dilution rates, whether it’s safe for kids (and at what ages), whether it’s best diffused or used topically, and more. NOW’s lack of safety information and data has been interpreted by some as them not having/knowing/caring about that information, but that isn’t actually the case. I wish that the labels better reflected what they know and the testing they do. There is one interesting point here, though. The FDA recently changed the way products can be labeled, so that items that are intended for aromatherapy purposes cannot be labeled as “food grade,” even if they actually are. Because NOW is so large and exports to other countries, the FDA looks more closely at their labels than most. NOW essential oils actually are food-grade, and could be used internally under the supervision of a professional aromatherapist (although they don’t recommend this), but FDA regulations prevent them from labeling them this way. This is not their fault, of course. Many oils state how they can be blended and with which oils, while NOW essential oils do not. This is not necessary, it’s just helpful info and looks more professional. This I’m not faulting NOW for. They’ve taken a firm stance against using meaningless terms to try to “trick” others into using their product. For example, “therapeutic grade” oils. Many people do not know that this term is completely made up by the essential oil companies, and that there is no third party definition or verification. Any company can slap this label on their product. Unfortunately, this convinces people that one company’s brand of oils are “better” or “safer” than another’s, for basically no reason. NOW chooses not to use this term, because they know it is meaningless. They also don’t waste a lot of time speaking out against their competition, so…. At any rate, NOW could use some label updates and a certified aromatherapist to provide better info on use, blending, safety, etc. They’re aware of these concerns, but aren’t communicating them well. What About Other NOW Products? I won’t get into too much detail about the other NOW products, because I know this is the major area of concern for my readers. But I will touch on some other areas briefly. This is a more recent and ever-expanding category. They offer quite a variety of oils, GF flours and pasta, mixes, nuts and dried fruit, and more. Almost all of these products are very clean (I have several of them). The only ones that concern me a bit are the sugar substitutes. Stevia is their favorite, but they do use erythritol and xylitol in the baking blend and a few other products. Some people are completely fine with these; others are not. I prefer not to use them. NOW does test their cooking oils as closely as they test their other products, so when they say they have “extra virgin olive oil,” they have personally verified that it is, in fact, pure olive oil. That’s been a huge concern for many over the last few years — that much of the olive oil on the US market is adulterated. Theirs isn’t. I can tell you that many of their products are tasty, too! Our first night, we had a little Iron Chef-style cooking competition. My team won! Our dish — a medley of fried chicken (in avocado oil), mushrooms, tofu, and eggplant over Southwestern quinoa, surrounded by a homemade barbecue sauce. Learn more about NOW Natural Foods. In this area, I feel much, much more conflicted. Some of their supplements, I stand behind and use myself. Typically the ones that are single-ingredient, like their pumpkin seed oil capsules. These are produced well, they’re pure, and I have no issue with them. The multivitamins and probiotics and more “standard” type supplements, though…I don’t really prefer. They use D2 instead of D3, and use synthetic folic acid. They use synthetic forms of several nutrients, and defend this use. One of their head supplement scientists did an entire presentation about how these synthetic sources are the same/better than natural sources, and even spoke out against the research into the MTHFR gene mutation. He said that folic acid isn’t an issue for people with the mutation. Quite a lot of what he said flies in the face of what every other natural-minded supplement company is both practicing and preaching, as well as the research I’ve personally done. Obviously, this really concerned me. I would not use their typical supplements, knowing how they were formulated. I still would and do use some of their single-ingredient, pure supplements. Learn more about NOW Supplements. NOW also has a sports nutrition division, but I know next to nothing about this in any sense, so I can’t really evaluate how they’re doing vs. others. I do know that they focus on using grass-fed, low-temp processed whey in their protein powder (well, one version of it), so it appears that they are doing well. But it’s not my area of expertise. Learn more about NOW Sports Nutrition. The CEO was very present with us throughout this process. He was available for our entire Thursday night, as well as our visit to their facility on Friday. Many employees praised him when he wasn’t around. He praised employees publicly and sincerely. He is a genuinely nice and humble guy who loves his job and doesn’t see himself as being “the most important” in any sense. I hear the owners are the same way, although I did not meet them. My perception of NOW is quite a bit different than it was before I went. I’ve seen that they have a strong commitment to value and making quality products available to everyone. In most areas, they’re doing that, and doing it well. I’ve been reading more about their history, and am impressed with the way they started and have grown. They’re still privately, family-owned and have no plans to change it — so they’re not influenced at all by shareholders or a corporate owner. 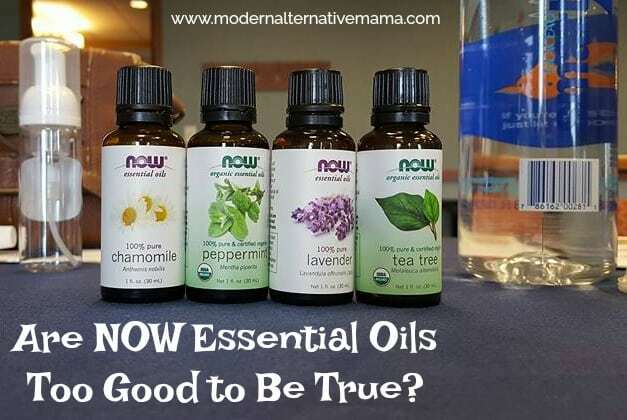 If you haven’t taken a look at NOW products, particularly the essential oils and foods, they’re definitely worth a look. By the way, you don’t have to take my word for any of this. Visit their website, and if you’re in the Chicago area, call and schedule a tour and talk to them yourself. They’re open to anyone coming and will be happy to show you around! Want to try NOW products for yourself? Entering is simple! Leave a comment below on why you’d like to win and what you like most about NOW. Open to U.S. residents through 8/13. Winner will be announced on 8/14. Are you familiar with NOW products? Has this changed your perception of the company at all?